A 20-time All-American and one of the top freestyle sprinters in UCLA swimming history, Jenny Susser won six gold medals at the 1989 World Maccabiah Games. 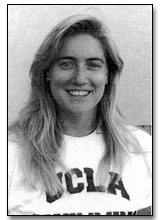 Susser competed for UCLA 1986-89, and held the Bruin and Pac-10 record in the 50-meter freestyle. She was also a member of the school's five record-breaking relay teams. For several years, beginning in 1989, Jenny was an assistant coach for the UCLA swim team.